Thank you for supporting Venture Richmond and the Richmond Folk Festival! Your donation helps to ensure the long-term financial sustainability of RVA’s premier music festival, hosting up to 200,000 attendees annually. This is a rain or shine, CASUAL event, much like the Folk Festival! Dress comfortably, and bring your appetite! BRING your Eventbrite receipt to the Folk Feast on Oct. 9. (You should have received this receipt via email). This will be your ticket to the event! PARKING is available at the Federal Reserve parking deck at the corner of 5th and Byrd Streets. Enter from 5th Street. Handicap Parking is available in the parking lot of the American Civil War Center, near the corner of 5th and Tredegar Streets. Only properly identified vehicles will be allowed access. 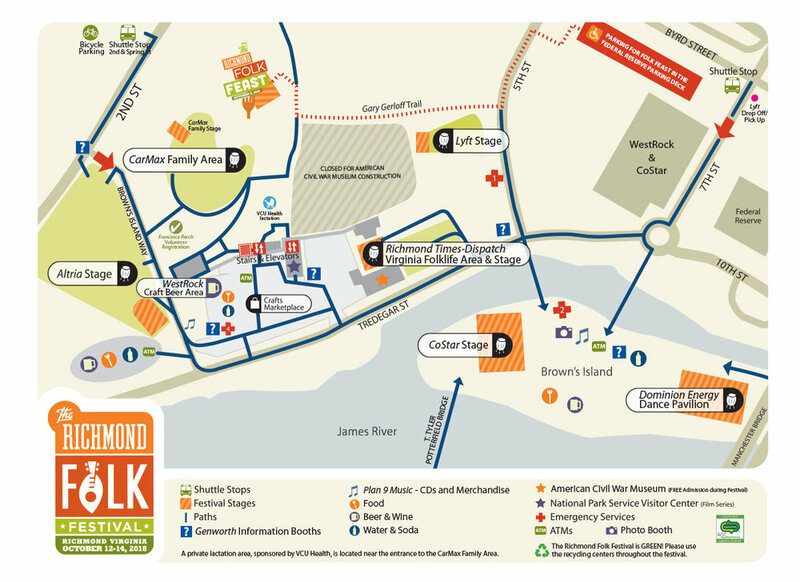 An elevator is available from the parking area to the FOLK FEAST tent, above Tredegar. Venture Richmond Events, LLC produces the Richmond Folk Festival. Venture Richmond Events, LLC is a 501(c)(3) non-profit organization. The amount of the contribution that is deductible for federal income tax purposes is limited to the excess of any money (and the value of any property other than money) contributed by the donor over the fair market value of goods or services provided. $80 of each $100 ticket purchase is deductible as a charitable contribution.